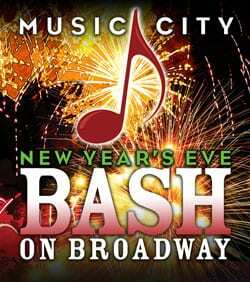 Partygoers at Nashville’s New Year’s Eve Bash on Broadway will enjoy music by The Farm, Eden’s Edge, Jeffrey Steele and Lynyrd Skynyrd. More than 30,000 people are expected at the downtown event, according to the Nashville Convention and Visitors Bureau. The free street party starts at 7:00 p.m. on Dec. 31, with concerts running for four or five hours. The event will be hosted by Storme Warren and will be simulcast on SiriusXM. A 15-foot red music note will be lowered at the countdown to midnight, replacing the guitar drop of past years. Click here for more info.